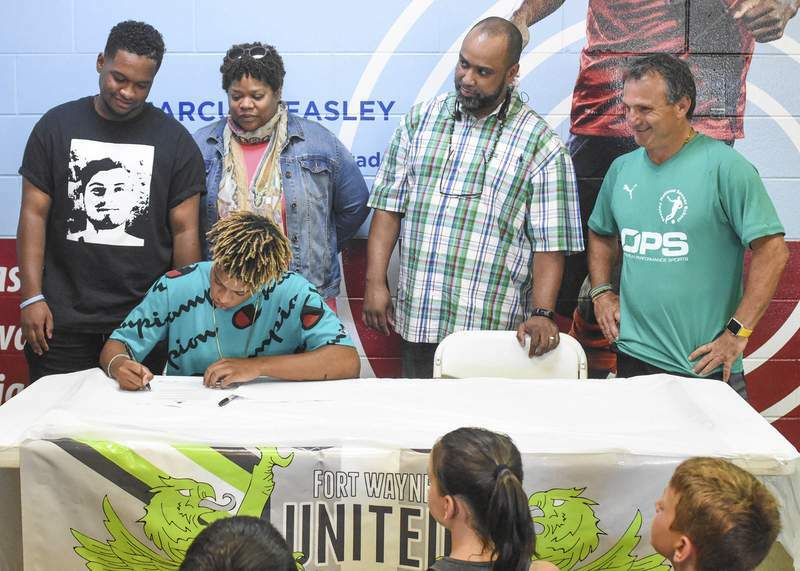 Michelle Davies | The Journal Gazette Akil Watts, 18, is surrounded by his brother Britt and parents Delphia and Larmondo and Fort Wayne United director of coaching Bobby Poursanidis as he signs a professional soccer contract Monday at the Plex. At 4 years old, Akil Watts was different. Now, at 18, Watts has managed to continue to separate himself from his soccer peers by signing a three-year professional contract with Real Club Deportivo Mallorca in Spain's second division, or Segunda Division. The 6-foot, 157-pound defender spent three months on Mallorca, a Mediterranean island, before committing to the club. “He was just different,” said Bobby Poursanidis, who runs Beasley National Soccer School among other programs at the Plex. “At 4 or 5 years old, he would take a soccer ball and come over and watch me train his older brother and then eventually he started to participate. It's very unusual for 5 year olds to participate in the skills that we were doing. I started seeing him developing and then right about 9 years old, he was training with the 13s. Watts got connected to Mallorca through Poursanidis, who has a friendship with Juan Manuel Pons, the director of the academy at Mallorca. “Bobby showed me Mallorca and showed me Juanma when I was talking to him,” Watts said. “He brought me over there and I really liked it. It just really fit me,” Watts said. “I just trained. I bonded really well with (the team). Watts will start with Mallorca's academy team. The transition will take some time, as with any major change, but Watts is looking forward to adjusting to island life. Watts attended Canterbury before transferring to the IMG Academy in Florida as a sophomore. He spent two years at IMG and then spent final high school year as a member of the Portland Timbers youth squad. In January, he was called up to the U-19 U.S. national squad at the U.S. Soccer Youth National Team Summit in Florida. In May, he scored a goal in the U.S. team's 8-0 victory of Kazakhstan in the Slovakia Cup. The American team finished third in that tournament. Despite undertaking a new adventure and opening a new chapter in his life, Watts remains faithful to the lessons he's learned along the way.